The Control4 Home Automation system can control nearly all aspects of a customer’s smart home, including security. Security is extremely important for any homeowner, and smart doorbells offer several features to maintain a safe and secure home. DoorBird is the industry standard for smart doorbells, with top-of-the-line cameras, real-time notifications, and video playback. Installing a DoorBird system in your customers’ home gives homeowners peace of mind knowing that their property is protected. With the DoorBird driver, customers can easily and conveniently see who is at the door, grant or deny access to their home by triggering a smart lock through the DoorBird app, and playback surveillance video all in the Control4 interface. This driver is a complete overhaul of the previous DoorBird driver, offering new features, capabilities, and icons. The DoorBird driver integrates DoorBird systems into Control4 so customers can access security features through their smart home control system. Customers can receive alerts when motion is detected at the door, when someone rings the doorbell, when a code is used on the smart lock, and more. New icons show the states of the DoorBird, visually communicating that motion has been detected, when the doorbell rings, if the doorbell has been silenced, and more. Without switching apps, homeowners can answer calls from their doorbell and talk to who is at the door as well as unlock the door from Control4. 5 Touchscreens now supported simultaneously! What makes this driver different? This driver is a complete overhaul of the original driver and contains TONS of new features and installation tools that enhance integration. Do I need to upgrade my customers home? Will I have to pay more for this driver? No – ALL existing and new licenses will work with this version. Just add the new driver in the project and you are good to go! Will the new driver automatically update the previous drivers? Yes, this driver supports the DriverCentral Auto Update system, which will update previous versions of drivers purchased on DriverCentral. The new driver contains some new interfaces into Control4. Because of this, auto update from the old driver (1005 or 8.x.x) will NOT auto update. In these cases, the dealer will need to delete and add this driver in place. Don't worry though... It's much faster and simpler to install and we recommend updating if you haven't already! Why do I need to install the driver instead of simply updating? Because new driver has new Proxies, an update would corrupt the Control4 project. Therefore, you will need to install the new DoorBird driver. The new driver filename is: doorbirdV2.c4z. Will the new driver software work with originally installed Doorbird models? This unit is controlled IP locally. Why can I not enter my username ‘gxxxxx0001’ into the new driver? DoorBird has changed the requirements for authentication and now only user 0002 can be used with Control4. Please review the documentation for more. I've lost my Digital Passport page... what do I do? You will need to factory reset the unit, which will issue a new Digital Passport. You can find the reset function in the settings of your DoorBird App. Please make sure to bring your DoorBird online via ethernet cable. The iOS or Android smartphone/tablet must be in the same network as your DoorBird in order to perform the reset. How many touchscreens can view the video at one time? The driver now supports 5 T3 touchscreens at once! This is activated/deactivated via the Alternate Camera property under the intercom. I have 8 T3 touchscreens and 1 table top T3- how does the 5 screen limit work in this environment? The video will only come up after the call has been accepted by the touchscreen. I see a new icon on the touchscreens, what does this do? There are two properties in the driver that correspond to tapping the DoorBird icon: Relay and Silence. Simply choose the best action that fits your clients’ needs. Silence is a mode that will block touchscreen (SIP) and announcements from triggering in a Control4 system. If Silence is activated, a two-hour timer is started and will revert to the original settings after timer expires. This feature is great for parents with young children who do not want the doorbell disturbing nap time or clients who want to ‘unplug’ from the outside world for awhile. This is not currently a feature of the driver, but we will look at adding this feature. Can I trigger the relay inside the DoorBird? Yes – to trigger the relay inside the DoorBird, choose whatever relay you are wanting to control (relay 1, relay 2, etc.) under the Events/Actions and choose what happens. Do I need to set DHCP reservation? While you should set this, the driver has been designed to update if the IP address of the Control4 or DoorBird changes. Note: SIP uses IP addresses and unexpected results may occur to the SIP server if IP addresses change. 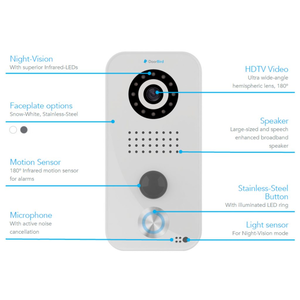 What settings can the customer change on the DoorBird from the Control4 App? These features are available via the Lock proxy (Under Locks and Sensors). Does the icon single and double tap setting in the app override what was done in composer? Both Lock Proxy Setting adjustments or Driver Properties are in sync all the time. Do the push notifications include a camera snapshot? Control4 is working on adding this into their API. When available, Cinegration Development will update the driver to support this. So the lock proxy has nothing to do with door locks, right? The lock proxy is a user management/lock management tool. The DoorBird can control many doorlocks and we felt the best way to operate those and provide the customer some really awesome history and settings controls was using the lock proxy. Currently, Control4 only allows access to the door lock via lock icon. If this changes in the future, we will update the driver. Are you going to have buttons on the new Control4 intercom app like the DS2 has? Intercom Buttons are displayed/hidden via the Intercom: Button property. Choose a lock or setting for each button and refresh navigators. the buttons will display/hide automatically. 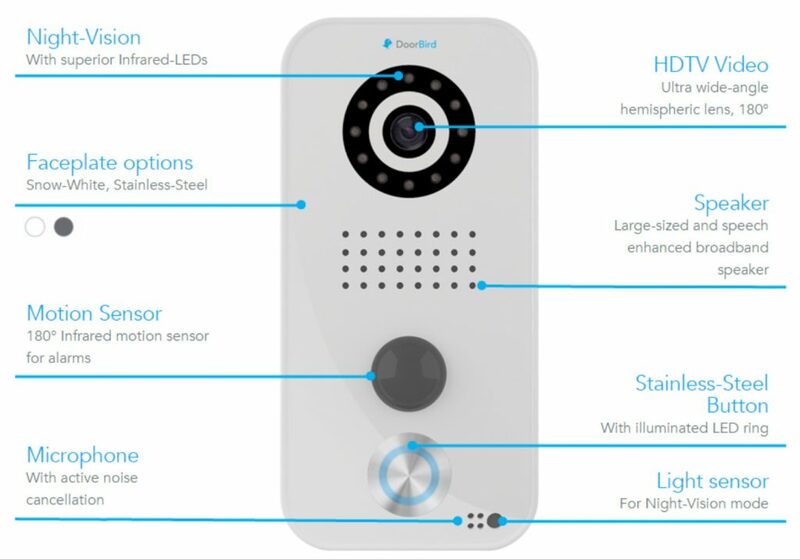 Can the Doorbird IO be used on a control4 system without a Doorbird Doorbell? hen turning on/off the notifications button on the c4 gui, do we still create the notification programming and add the customer's cell syntex .txt within the c4 programming? What happens if two users on two different devices attempt to answer a call from the DoorBird at the same time? The DoorBird App will override a touchscreen call. What is the best way to update the DoorBirds firmware? Firmware updates are sent out by DoorBird as they become available. The Current version is 112. If you have a unit that is still running an older version, please send the MAC address to Andrew.knuesel@doorbird.com and I will have the update pushed to the unit. Is it possible to update the DoorBirds firmware from the driver? How can you static the DoorBird ip inside the DoorBird app? I've had trouble with the DoorBird while its ip is reserved in the router. There isn’t a way to static the doorbird ip. The new driver supports IP address changing automatically. Will zdb video work with wireless Touch Screen? Will the driver work with a multi-home doorbird? Yes. Note: The control4 system and any touchscreens MUST be on the same LAN. Is there a limitation as to how many devices it can push notifications to? This would be a limitation of myHome devices on Control4. The driver sends the push notification to Control4 server, and the server handles the distribution of the notification. Does the driver work with Wireless Touch Screens and/or the DoorBird app? The Drivers works with all Control4 MyHome devices and Control4 T2 and T3 touchscreens. ou can use 0003 as well, right? The driver only works with user 0002. Refer to driver documentation for more exciting info on doorbird users. Passwords are managed by the DoorBird app. Is the new version you are about to release (1008) going to fix the issues with the EA- navigators regarding video? This was fixed in DoorBird firmware 111. Can you connect to a doorbird off network? (I.E., trigger events based on a DoorBird at a secondary home)? Can you manually type in an IP address, or is it only auto-scanned "Found DoorBirds"? Currently cloud based/push notification from one doorbird to another location is not supported. Are there still issues with doorbirds behind a managed switch? If using a DS Mini in combination with a Doorbird stationm will both be able to work together? This driver allows you to go to security via c4 gui and see the camera live as well as your house cameras correct? Have you had success increasing speaker volume without distortion? It would seem that 50% is the best it will do. Cinegration Development and DoorBird are always working to improve audio quality. We will test and update if needed. If a Doorbird goes offline, is there is a way to know through notification? The driver will send a push notification (Alert Level) DoorBird is Offline. On the setup, do we have to setup the proxies or only the main driver? Only the main driver. The main driver will ‘push’ the settings to the slave proxy drivers automatically. Can you still bind actions FROM the native doorbird app? (ex: using the light icon in the doorbird app to trigger a light through C4) This was possible in the old driver, but I haven't seen it in this one. Yes. Under the properties, and set an action on -> Intercom: Button 1 and 2. Once they have actions assigned, refresh navigators and they will appear. Can I use the relay trigger to open a Yale lock somewhere else in the house? Yes, use the Events Menu, choose relay 1 and select your yale doorlock. This will TOGGLE the yale doorlock every time the relay 1 event is triggered. I'm running 2.10.2 and in the doorbird tab settings under locks and sensors, my bottom 4 selections under Use Push Notifications just say "text"
Control4 has a Navigator, but on the Android lock proxy that causes properties to be shown incorrectly. Until this is fixed, the custom settings page only works on iOS. Is motion masking only done from the DoorBird app? When are the D2101KV door stations available? Watch this video to see how the DoorBird driver adds simplicity and convenience to your smart home system! View the DoorBird Webinar Here. DoorBird hardware supports two methods for communicating to the unit. Through the DoorBird app and through SIP. SIP is a communication method to ring/call touchscreens on a Control4 system. 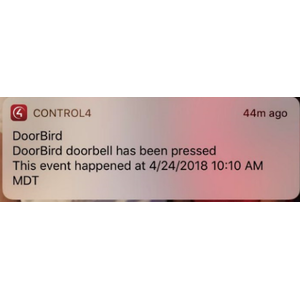 The DoorBird registers to the sip server (Control4 Director) and when the doorbell button is pressed, the driver sends a command to the DoorBird to make a ‘call’ to a call group. By default, the call group used is All touchscreens. This can be adjusted using the event settings in the driver. By default, SIP is designed to have the video come AFTER the call is answered. Because of this design of SIP, Cinegration has worked with DoorBird to support up to 5 touchscreens with video preview (T3 Touchscreens only… InfinityEdge Touchscreens use older MJPEG and only 2 touchscreens will work). The video preview is accomplished by using the Alternate Camera setting. This setting tells the driver to use a different video stream than what comes with the sip call. This is automatically setup when the driver is installed, and most dealers should not need to adjust any settings. However, if dealers need to customize the integration, click on the intercom proxy under System Design and adjust the settings of the DoorBird. New to the V2 driver, Cinegration has added in the ability for homeowners to adjust some of the settings, see history and add/change users on the DoorBird all through the Control4 system. This is done via the Lock proxy which can be utilized by clicking the > next to the lock that is bound to the DoorBird. Note: DoorBird API does not currently support adding/editing users. This will be enabled soon. There are times when a customer may want to temporarily disable the announcements and touchscreen call. By default, double-tapping the icon will put the driver into Silence mode for 2 hours. When this happens, announcements, composer actions, intercom calls will be turned off. The DoorBird app will continue to work. Double-tapping the icon again will turn the actions back on. Notify: Composer Event -> This setting will enable or disable any dealer created Composer Actions for this event. Cinegration is working with manufacture and Control4 to resolve. When a resolution is found, an update to the driver will be provided via DriverCentral update system. Android interfaces, do not show correct settings under lock proxy. A brief explanation on users with the DoorBird should be understood before implementing a DoorBird solution to your customer. The DoorBird by default has 2 users. These are represented by the last 4 numbers of the username. Example: gyxeda0001 would be user 1 (Homeowner). Homeowners should use user 0001, 0003, 0004, or higher. User 0000 should be saved in dealer documentation and ONLY be used for configuration of the DoorBird. User 0000 does NOT receive notifications (doorbell push, motion detected etc…). User 0002 must be added and is designed to be used for 3rd party integration. DO NOT THROW AWAY DIGITAL PASSPORT that comes with the DoorBird. There are at least 2 copies that come with every unit. It is recommended that the dealer give the English or version of the correct language to the customer and keep the other on file.